The right spices can really transform a recipe. In this recipe for Holiday Spice Oatmeal, we used ginger, cloves, and cinnamon to infuse simple rolled oats with classic holiday flavors. Leftovers can be stored in the fridge or freezer and microwaved for a quick breakfast on another day. Spices are one just way to add flavor to your oatmeal. Find out what other healthy ingredients you can add and get tips for making a better bowl of oatmeal. 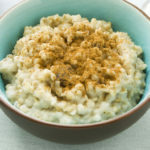 Plus, check out more yummy oatmeal recipes. We used ginger, cloves, and cinnamon to infuse simple rolled oats with classic holiday flavors. It's sure to warm you up on a chilly winter morning. Bring water and salt to a boil in medium saucepan over medium heat. Add cinnamon, ginger, cloves, and turmeric (if desired); mix well. Let oatmeal stand 1 minute before serving. Divide evenly between four serving bowls; top each evenly with honey (if desired) and milk.